If there is one thing that a visitor to Japan cannot miss, it is the greenery. More than two-thirds of the country's land area -- 68 per cent, to be precise -- is forested. No other country has as much forest in terms of percentage of land area. And all this is despite the fantastic industrial growth and very high density of population. But it is not that Japan has always had large, healthy forests. The state of its forests has been pretty much see-saw. Since time immemorial wood has been an integral part of Japanese society and culture. Evidence, dating as far back as 10,000 bc , reveals that forests were utilised by the Japanese for food, wood, construction and many other products. Exploitation of forests declined in the late 17th century. In the coming century, woodland holders started adopting methods to improve production. This led to a sea change in Japan's approach to its forests. In 1897, forest laws were introduced, massive afforestation undertaken and several incentives were offered by the government for restoring forests in order to meet the demand of industrialisation. World War- ii dealt a telling blow to the country's forests. But, again, in a manner typically Japanese, forest management was overhauled. And so the present state of Japan's forest. But the Japanese have been severely criticised for promoting their forests at the cost of forests in developing countries, especially Southeast Asia (see box: Plunder thy neighbour ). Japan's history of forest management is an interesting study in dos and don'ts -- a paradox of inspirational revival and using other countries to promote its own forests. 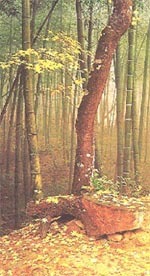 Exploitation of forests was at its height during the Edo era (1603-1867). Tokugawa Ieyaus took over the title of shogun (generallissimo), declaring himself the ruler. Under him, the Tokugawa shogunate and the feudal warlords took over the administration and transferred the capital from Kyoto to Edo, which has grown into Tokyo now. Their land holdings were bigger than those of the imperial families. - forests owned by individuals, temples or shrines that were utilised by the samurai warriors. Even the forests owned by individuals and communities were controlled indirectly by feudal lords by levying taxes. The feudal rulers were involved in grand projects that consumed a lot of timber for the construction of temples, shrines, monuments, statues, buildings, and even building cities and towns like Edo, creating a great demand for timber and related products. This construction boom remains almost unparalleled in Japanese history. Timber business thrived as there was a lot of money to be made. The feudal lords continued to control the lands by declaring any forest with good quality timber as protected. Gradually, forests owned by individuals shrunk and those owned by feudal lords expanded. The feudal lords' greed and growing restrictions generated a conflict between local communities and the State. Growing conflicts and other factors led to the decline of the Tokugawa rule and feudalism. This was followed by the resumption of the imperial rule under the emperor Meiji in 1868. This period, called the Meiji Restoration, was the onset of a new era. Meiji rulers were bent upon transforming Japan into a capitalist, industrialised country. They abolished feudal ownership of land and recognised individual ownership rights. Large forests, previously owned by communities and feudal lords, were nationalised. Edo was renamed Tokyo. The government sought to transform the fragmenting forest system into a uniform and modern one. Towards the end of the 19th century, forestlands were categorised broadly into two sections: national and non-national forests. The Meiji policy of recognising the ownership rights of land led to the growth of privately owned forests. As there were taxes on forest holdings, poor land owners were compelled to sell their land to wealthy landowners and timber merchants, leading to a consolidation of private forest land. By the 20th century, two-thirds of the forestland shifted into the hands of the government and public bodies. To meet the timber demands of a growing economy and to modernise forestry, the forest law ( Shinrin-ho ) was enacted in 1897. It identified twelve types of protected forests, encroachment of which was strictly prohibited. Nationalised forests were brought under large-scale afforestation and infrastructural development projects between 1899 and 1921. It projected an initial target of 4,000 hectares (ha) per year, which peaked at 40,000 ha per year in the final stages. About 380,000 ha is estimated to have been forested under the project. The government began promoting afforestation on municipal forests by providing seedlings. This was followed in 1907 by a nationwide afforestation programme called Shokuju Shorei Kisoku . It suggested the constitution of forest cooperatives if two-thirds of the owners holding two-thirds of the forest area in a specified region agreed. Once this was formed, the owners of the remaining area were obliged to join. The number of forest cooperatives increased from 547 in 1911 to 5,086 in 1946. There were subsidies to promote silviculture, building forest infrastructure and other similar activities. To support Japan's war campaign, unprecedented felling of trees took place, destroying of 400,000 ha of forests by 1944. After the war, the main task of the government was to rebuild the war-ravaged economy and restore degraded forests. Important changes were made to the management systems of national forests. Forest cooperatives were reorganised and members were offered loans, tax concessions and subsidies. By 1952 the total afforested area increased more than five times as compared to 1945 -- from 70,000 ha to 400,000 ha. The total afforested area between 1951 and 1960 was estimated at 3,750,000 ha. According to Kentaro Kanazawa of the Japan Environmental Council, "Approximately 40 per cent of Japan's forests is accounted for by afforested trees such as cryptomerias and Japanese cypresses." Between 1971 and 1986, forests expanded by almost 38 per cent. Post-World War- ii , Japan's successful regeneration of its forests lay in not utilising its forest resources and importing large quantities of timber from Southeast Asian countries like the Philippines, Indonesia and Malaysia. "Only about 30 per cent of the volume of trees grown in Japan's forests are cut down each year," says Kanazawa, "and the percentage of domestic self-support of lumber does not reach even 20 per cent." According to a survey by the Food and Agriculture Organisation, an average 2 million ha of tropical forest is lost in tropical Asia. The Japan Federation of Bar Associations claims that Japan's import of timber from neighbouring countries significantly contributed to depletion of tropical and other forests, loss of many species and the deterioration of soil. Imported timber is cheaper and better in quality. By 1986 the import of tropical timber for the entire European Union was 15.72 million cubic metres (mcm), while that of Japan was 15.71 mcm. Between 1989 and 1991, Japan imported forest products worth more than us $13,077 million and exported forest products of the value of over us $1,658 million. Kanazawa says more than 60 per cent of this import is from the Malaysian state of Sarawak because of which "the tropical primary forest is on the verge of exhaustion". The effect of this is very bad on the Penan tribal people of Sarawak, who are nomadic hunters and survive on the forest and its produce. Local governments in Japan have started taking steps. On October 10, 1991, the Tokyo metropolitan government announced a policy to reduce the use of tropical wood in construction projects. The chief of the construction bureau of Nagoya city issued a notice to industries to use plywood not made from tropical wood. However, Japan will have to do much more to ensure that its forestry policy does not destroy forests in developing countries. If it continues with the ways of the past or is sluggish in changing the present state of affairs, it stands to be labelled in the international environmental community as an imperialist nation that cannot look beyond its backyard.